For property owners, backflow in their plumbing systems can result in everything from sickened customers and employees to the closing of their business. Backflow is the unintended reversal of a plumbing system’s water flow. Rather than flowing to the intended destination, water reverses course and flows in the opposite direction as a result of back pressure or siphonage. When this happens, the results can be deadly. In response to the dangers posed by backwater, state and federal regulations were created to ensure the safety of the public. As it stands, all property owners are required to install certified backflow prevention device testers, maintain the upkeep of these prevention devices and test the devices yearly. Every water line on a property must have a backflow prevention device that is regularly maintained and annually tested. The installation and testing of these devices can prove complicated for the average property owner. Therefore, hiring professionals to complete your property’s NJ commercial backflow testing requirements is critical to the health of your customers, your employees and your business. Argent Plumbing has been providing backflow installation, maintenance and testing services across Somerset, Union, Morris and Essex counties for years. Let us keep your property’s water supply safe and up to state regulatory standards. When it comes to backflow prevention, there are two general techniques: check valves and air gaps. Argent Plumbing will install, maintain and test both options – along with guiding you through an assessment of which devices will work best for your property’s plumbing needs. By state regulation, automatic check valves are required for each water line. The type of check valve required for a specific line varies depending on the contamination risk of that water line. The higher the risk of contamination, the more complex the valve will need to be. The installation and testing of these check valves, particularly for water lines with high contamination risks, is complicated and requires the use of certified backflow prevention testers from Argent Plumbing. Air gaps are a more complex and effective system of backflow prevention. An air gap is exactly as it sounds: a vertical separation between the end of a water supply and the edge of the receiving vessel. The height of this vertical separation is dependent on the diameter of the outlet. All air gap separations must be at least twice the length of the outlet’s diameter to meet state and federal regulations. Again, a certified backflow prevention tester is critical to ensuring your air gaps meet all standards. State and federal regulations require that all backflow prevention devices be tested yearly by a certified professional. All backflow prevention devices come with built-in test parts. The testing process is fairly straightforward for professionals and can usually be done within a day. For outdoor pipes, you need not even be home for the testing to be completed. During the backflow prevention testing session, certified testing technicians will connect a test kit to each of the pipes to verify proper operation. In order for the testing to be completed, all downstream water must be shut off before testing. Upstream water can remain on. Once each of the water lines has been tested and has passed inspection, operation can resume on the full line. One thing to note: this includes all cross connection lines. Federal regulations also require the annual testing of any pipe or valve that is used to connect the public’s water system with auxiliary water, cooling or irrigation systems on the property. Any pipe that runs from potable water on your property and connects to the public’s drinking water supply is considered a cross connection line and must adhere to testing regulations and schedules. If your property needs new mechanical backflow prevention devices installed, or your current systems are in need of maintenance, call Argent Plumbing today. Our team of respected, experienced and professional backflow prevention and testing technicians will visit your property, assess your plumbing pipelines and complete all installations and testing needed that day. 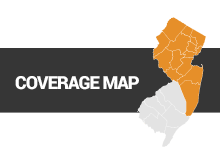 Our technicians serve customers located in and around Morris, Essex, Union, Hudson, Bergen, Passaic, Somerset & Monmouth Counties. Don’t let contaminated backflow ruin your health or your business.